May 2002. 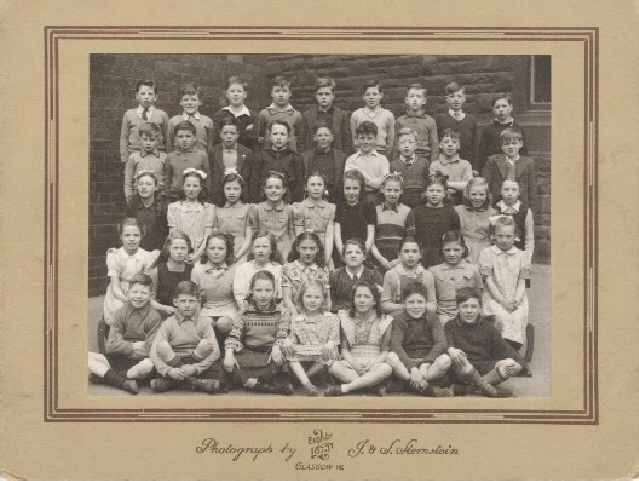 May Ballantyne (nee Cuthbertson ) sent in this class photograph. "I thought you might be interested in this photo from Queen Mary St.school in 1947.I am the girl in the middle of the second front row My name then was May Cuthbertson,and I lived at 106 Bernard St.I lived at 106 and went to Queen Mary St. School. My young sister went to Dalmarnock PS .Her name was Ann Cuthbertson then. She is 52 now and living in East Kilbride. I loved your site reliving old memories. Pals reunited after 37 years....thanks tae GlescaPals! I last saw her here in Canada in 1967 and now thanks to your site we have finally clicked .WE hope to meet soon after all our cauld and sna'go away as she lives about 100 miles from me .If anybody else remembers me please get in touch .Thanks again for your site . May"
Hi Webmaister Happy New year to you and yours its been a wee while since I wrote but I had to tell you I had a phone call from another classmate from Queen Mary St. School Class of 1947,11yr.olds Davie Hendry. ( top row no.4) He is living in Florida.